save error. i do know i had a containment and a second moonpool created at the mountain island location before last update. i have succesfully , so far, been able to play and save a new save game. i hope there will be a future fix. amazing and addictive game this is. i cant play many games due to my vertigo. I'm having this same issue also accompanied by a non-stop graphical glitch where multicolored squares keep flashing across my screen normally in a circular formation, been having it for the past 3 updates or so. There's also one specific Jelly Ray in the mushroom forest biome below the front end of the Aurora that's always suffering from the "black box syndrome" where as it's normally at random with infected individuals ( for me anyways ). The floating island where the edible plants and surface settlements are located does not load. I have started a new game due to save error. Now the new game is receiving same save error. I only made one initial base in the safe area on this game save. No moonpool created on this save. I also have some things to report. Occasionally the rays have a black square covering them as some sort of graphical glitch. The wrecks do not load completely most of the time, and when they do actually load, none of them have blueprints in them. Without that i haven't been able to find quite a few of the technological advancements needed like the moonpool fragments or the arms for the P.R.A.W.N. suit. freedom save game received save error. on to 4th game. also created floating locker placed items in. i sam to a different biome and came back to an empty locker. found a glitch, when looking at the sun, a large black box appears over it. Help? I also lost items from a floating locker. Purloined by a peeper, I suppose. So far, in the bit of time I've spent playing through SN since the latest update, these are all the bugs/issues I've encountered. I haven't played since the first version was on xbox, so a few of these may be long running bugs. As you continue on, lag seems to get worse and worse. Even in areas where there should be nothing loaded, (eg the sky) there's lag. Scanner room is nearly obsolete after a mere 5 minutes of gameplay - even items stored in nearby containers can be scanned for - this happened to me with lead, and eventually the markers were on me as I was carrying the lead. This would be acceptable, if the list was not restricted, and the added items made sandstone chunks (and wrecks) impossible to scan for. Switching to a seaglide and then back to any other item messes up the animation for the item. PDA scrolling in the Data Bank doesn't work. If you have more items than can be displayed, the ones passed the limit can be viewed, but it does not scroll. The selector simply goes outside the PDA. VMS in moonpool doesn't appear to work properly except at the ends of a moonpool. Living walls' hitbox is slightly outside the wall (at least in multipurpose rooms), and you must either struggle to build it or leave the base to build it from the outside. Items will be consumed/destroyed when inventory is full if you try to pick it up, such as a creepvine seed cluster. Pressing B while in a menu/PDA inside of a vehicle causes you to exit the vehicle rather than the PDA. Scanner "infected" message (when scanning a creature) will occasionally flash too quickly/disappear if you hit a button immediately after scanning completes. Laser cutter acts like a low power flashlight in dark areas. Beacons bob up in down like crazy (the HUD icon, not the physical object). Chance of an ore falling through the ground when a Stalker steals a nearby Scanner Room camera drone. Base-Attached air pump is either invisible or has no texture, not even while being built. Base parts can be built without the full blueprint: I built a multipurpose room before I even found one to scan. If you attempt to fabricate something without sufficient power, remaining power is still consumed. When fabricating specific objects like Titanium ingots, it automatically removes you from the fabricator menu after completion. Materials don't update after fabrication, eg it will tell you you have the materials (highlighted green) until you back up at least a step and go back. Fabricator controls seem spastic and jump all over the place. Silver seems extremely rare compared to the likes of gold. I have had almost an entire locker full of gold, and have managed to have no more than 2 spare silver at any time. The drop rate of gold from a sandstone outcrop in my opinion is too high, considering it's also a common drop from basalt. The "scan" icon on the bottom right (showing that you can or haven't scanned an item) shows when looking at a creature you have scanned. Ex, I scan a hoopfish for the PDA entry, still shows the icon, and I'm unsure later if I've scanned it or not. If a object is against a wall, parts like living walls and windows cannot be placed. Not major, but preferably something to be changed so I don't have to empty and disassemble my lockers to place a window or decorate after the fact. Oxygen count only updates every three seconds. This is mainly a problem in depths below 250m without a rebreather, as it will jump from 10 to 1 in this time. Also, at this depth it'd make sense to either have a HUD notification stating that you go through about 3x as much O2, or reduce the timer for the oxygen tank to represent the real time. I didn't realize this until I died about 5 times. If anyone can confirm/deny/suggest a solution to any of the above, I'd be thankful. I've reinstalled SN 5 times since the twins update, the saves still become corrupted. I've also done a factoy refresh on the Xb, reinstalled SN. Still have save problems. 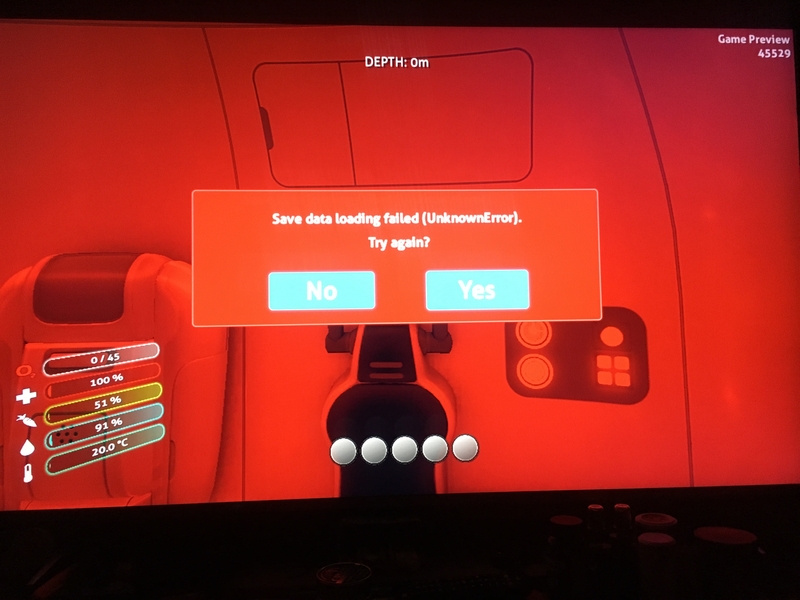 XBOX SUBNAUTICA IS UNPLAYABLE DUE TO THE LOAD ERROR FAULT!!! when is the fix due? The door was open when I went to the Precursor gun then shut behind me so I can't escape. So I've got a new one I haven't seen yet. I was furious my saved game wouldn't load after many attempts of uninstalling and reinstalling, hard rebooting, and clearing saved game data I decided to try and just spam my A button on my Xbox controller and see if something would work. After doing this 3 or 4 screen times it attempted to load me into a new game but also attempted to load my old save as well which as you can see did not work. Just thought this was interesting maybe it'll help in a way who knows. Good luck on finding a solution to this problem. I would rather not lose my save this time please thanks. I've noticed that exterior lighting that shines through a window and onto an interior wall (from the glow of seedpods from creep vines planted just outside) remains, even after the window through which it entered into the base has been removed and replaced with a wall. Not a big deal, but you guys will probably want to fix this prior to release, as it tends to bring you out of the immersive (pun alert) experience of the game somewhat. Also, I had a game recently (before the "save/load bug" hit it and rendered it simply a series of fond memories) where, every time I restarted from a saved game, I'd have to remove the MK3 Pressure Compensator (to 900 meters) upgrade and reinstall it for the Seamoth to go below 200 meters without damage. This was when restarting the game with the Seamoth docked into the moonpool (I didn't try it any other way). This aquatic game setting is so original and I applaud you guys for continuing to refine such a great, fun game. I can't wait until you guys dial this game in and release the final version. Keep up the good work! Have you guys ever noticed this one: fish in the aquarium (not the alien containment, but the small rectangle aquarium) seem to lose much of their animation after they've been in the tank a while? I put a couple of newcomers in the tank when I already had maybe four fish in there. I noticed that the newcomers' animation was much better (moving their tails and bending their bodies) while the "older" fist were stiff and simply glided around the tank. I immediately took the "older" fish out and then put them back in, but they remained stiff and lacked animation. I distinctly remember them being more life-like when they were originally placed in the take. Weird. I'll have to pay attention, if this game continues to dodge the save/load bug, and build a new aquarium to see when it is that the fish seize up...prolly after a load, but I'm not sure. anyone notice the life pod with the radiation suit does not have it anymore but has the compass there only? Everything has changed, most wrecks have only fragments you have already scanned. Blueprints for the standard and advanced fabber need to be 'discovered'. So far I have only found blueprints near LPs. But my longest save has only been 2+ days. Here's hoping it gets better. Are you sure you're at lifepod 6? Biggest problem I've been having in the game so far is a constant drop in the frame rate; Especially in the Seamoth, where the frame rate will sometimes drop to zero and will sit there for about 5 seconds. I haven't built a Cyclopse yet. Athother problem I keep having is that my knife keeps disappearing. I've had to build four in the first two hours of the game, and I didn't even get a chance to use one of them. Some other bug I've noticed are: Items disappearing from the floating locker. Not being able to create certain items (like the advanced oxygen tank) after finding the blueprints for them. Exiting the Seamoth whenever I press B in the pause menue. And the POV changing to either the back of the interior of the Seamoth or outside and adjacent to it while trying to save while insideof it. The POV changes back to normal after a few seconds. What mode S, F, H or Creative? The Devs' probably need to know. Not sure about the knives. I think everyone has issues with the floating lockers. I've been looking for the tank upgrades for over 7 game hours, can't remember where they are. In the Moth or PRAWN, press the same key to stay inside. I try not to save inside the Moth or the PRAWN because I've had to swim back to them If I died.